BabyDoll is a Goffin’s Cockatoo, and one of my youngest. She is a semi-rescue. 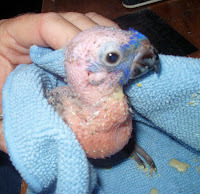 After ‘rescuing’ Fred (my Bare-eyed Cockatoo), I swore I would not get another ‘Too. Not that they’re not sweet birds, they are, UNLESS they have been badly re-homed, abused, neglected, even accidentally taught bad habits, they can be absolute monsters. OR in the case of BabyDoll – forced weaned. Force weaning is the morally reprehensible practice of unnaturally accelerating weaning to get a bird on the market faster. In general the larger the bird, the longer they take to wean. Macaws can take up to a year to properly wean, Greys and Toos anywhere from 4 to 6 months. There’s really no hard and fast rule, but there are general guidelines. But you can’t go from spoon feeding one day, and solid food the next, with no further spoon feedings. It amounts to the same thing as bottle feeding a human baby one day, and the next day handing the child a hamburger. It wasn’t immediately apparent, BabyDoll was forced weaned. 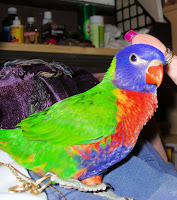 When I first saw her, she cried whenever you got close to her cage, not uncommon with young birds in new surroundings. I thought she was cute and cuddly, but outside of that, I had no real interest in buying her. After several weeks (I visit this particular shop once or twice a week) the “baby crying” not only didn’t stop as it should have, but became incessant. I continually pressed my shop owner friend, and bit by bit learned BabyDoll’s childhood. The breeder had indeed been in a hurry to “get rid of BabyDoll”. She had made a grievous mistake with BabyDoll’s older sibling, and it had died. Actually it was killed by the breeder’s Husky, when she left it on the kitchen table to go get the mail. Aside from the loss of income for the bird, she was supposedly too upset to take anymore time with BabyDoll, but assured my friend BabyDoll was fully weaned and indeed ready to go into a shop – LIE! One of the clues (aside from her admissions), that BabyDoll was force weaned was her beak. Young birds beaks are not putty, but can become misshapen, and “scissor beaked” if too much force is repeatedly applied to one side, such as with a syringe during feeding. Think of it like a toddler becoming buck-toothed from sucking their thumb. BabyDoll’s incessant crying – one of the physical and psychological side effects of force weaning, was becoming apparent to doom her to live her life in the pet shop. My shop owner friend said that while everyone who considered buying her thought she was “cute as a bug”, they couldn’t stand the constant crying and begging, which didn’t stop even if you picked her up. She actually got her name because the crying sounded so much like a human baby crying. Some may say I’m a sucker for the ‘underdog’, but no one else was going to “step up to the plate”, and I bought BabyDoll. Before we went home, we paid a visit to my Avian Specialist at the vet’s office. He very gently reshaped BabyDoll’s beak, to give her a better chance of it realigning normally. She received several different nutritional shots, since she was severely underweight, and undernourished. After much discussion with my vet, it was decided, that I go “back to the beginning” and hand feed her in an effort to wean her correctly. 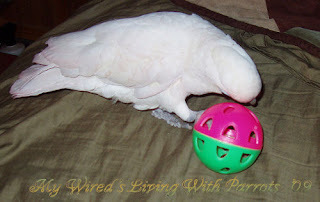 For those that think hand-rearing and weaning a bird is a cakewalk – think again. Its a serious commitment, that takes an extraordinary amount of time and care in the best of circumstances, let alone compounding it with psychological issues. When I got home with BabyDoll, I started from scratch, feeding her every 3 to 4 hours as if she had just been taken from the parents. She had no problem accepting hand feeding, since that’s what she had wanted and needed all along. When her weight came back up to an acceptable weaning weight, I gradually added a seed, nut, pellet, fruit and veggie mix to her mealtimes. She “weaned out” of her own choosing (as it should be) in about 2 months. As she showed less interest in spoon feeding (I hate syringes), we played more with ‘big bird food’. The incessant crying stopped in about a week after getting home, since she was getting what she needed. There was the occasional begging around meal time, but not the heartbreaking squalling. She still has serious mental issues we are working on, but that’s a whole other novel. Knotting, macrame’, weaving is not new. Depending on what part of the world you live in determines at least in part what the knot or weave is called. What I know as a Girl Scout Lariat knot is also known as a Chinese cube knot. That same Girl Scout knot woven repeatedly in one direction, translates into a Chinese Zhu knot. What one person calls a Celtic knot I know also as a Josephine knot. What one person calls a Double Coin Knot, I call a Turk’s head knot. Are you beginning to see a pattern here? Knots are not new. Knots in one form or another have been around for centuries. What’s being done with them in regards to jewelry is fairly new. One of my favorites is the Turk’s head knot. 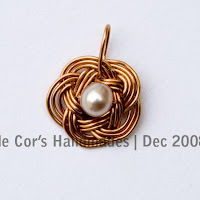 Corra recently previewed one flat, with a pearl center as a five petal flower knot pendant – her variation of a Double Coin Knot (its soooo cute)…..
That same knot, pulled differently, forms a band, and pulled even tighter still, becomes a ball. (I’ve made key chains with the ball version). Now I made these as a band years and years ago in cotton cord, as a bracelet. I’d weave it, stretch it on, run it under hot water, and it would shrink and conform to my wrist. People were amused by it, since it had no clasp and no apparent way to get it on or off. The fact that it was made with one continuous piece added to the amusement. Loren Damewood teaches this knot as a band and creates some exquisite sterling and gold rings. I saw a picture of his rings many years ago, and thought “I know that knot, I can do that – right?” Well sort of – I’ve done ONE, although I’m sure I did it the hard way, since I wasn’t all that anxious to do try it again. 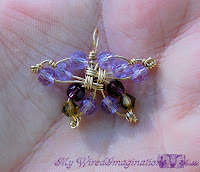 Diane Karg Baron has a tutorial for beautiful Celtic Knot Earrings, similar knots I learned doing Macrame’. Perri (who drew inspiration from and credited Remy Heath), recently did an earring tutorial ‘Mobius’. Look closely, its a square knot from Macrame’. Now before you start running for your workbench to try it in wire, be warned, its not as easy as it sounds. Just because you know the knot in cord, doesn’t mean you can do it in wire. There’s a reason Perri’s earring “looks like” cord, but are made of wire. If you’d like to make these earrings or add this knot to your designs, Perri’s tutorial is worth 10 times its weight in gold – tips for creating perfect knots, and how to do it without tearing big gashes in your fingers in the process is priceless. 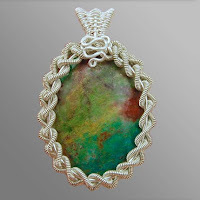 Since Corra’s and Perri’s tutorial and jewelry postings, several artists have “been reminded” of these and other knots, and incorporating them into their work. Which brings me to the second half of my blog title. Giving credit where credit’s due. This is probably the single most important ideal out there; that some seem to forget or only “selectively” remember. This does not just apply to knotting and weaving or even just wire work, but all manner of jewelry creation.Many jewelry artists post a long speech in their tutorials about being given credit; or become quite huffy if they are not paid homage if their design is used and they don’t receive credit for it, yet when it comes to their own admissions as to what or who inspired them, well those admissions are conspicuously missing. The only reason I can think of for this is possibly a belief that it will somehow diminish their artistic credibility. This is so far from the truth, it couldn’t be more wrong. What some people fail to realize is that the Internet has a LONG memory. Sooner or later fans of your work will find out where you got your inspiration from, or who reminded you of a knot you forget you knew. And since you have claimed from the beginning that the idea was yours, or simply even neglected to to credit your inspiration, you end up in a bad light. Even if it wasn’t your intention, you look like you stole some one’s idea and ran with it. Had you, from the beginning, said something like ” I was inspired by so-and-so’s beautiful piece, or reminded of this knot by so-and-so, to create this variation”, your fans would have not thought any less of you. Quite the contrary, they would have thought more you, because you were generous enough to admit to being inspired by another artist. Do I sound like an “ex-fan”? Its because I am; a very disappointed and disillusioned one. Recently I found out that one of my favorite tutorials, from from an artist I had great admiration for, was not their own idea. Yes their design for the tutorial is different, but not so different; seeing the original design from the ORIGINAL artist there is no doubt where they found their inspiration. I do not say this lightly – nor was it even the original artist that pointed this out. And believe me, I did check for myself. The cover piece for the tutorial IS definitely different, the “prototypes” and variations in the tutorial however leave no doubt. Now had the writer used something similar to my earlier example say “I loved so-and-so’s piece and was inspired to create my variation of it”, I honestly would have had NO problem with it. It would not have taken anything away from their design. To learn that this same writer has done this numerous times – drawn inspiration from other artists, without giving the small courtesy of credit for it – actually hurt my feelings; I feel somehow betrayed. I still admire this person’s artistry and skills, I just feel that at their level of skill, the omission of acknowledgment to a fellow (equally talented) artist, amounts to a snub, and seriously unprofessional. Now – before someone tries to accuse me of being a pot calling the kettle black – I’m not. I have no problem whatsoever telling anyone where an idea comes from, if I was inspired by another artist. Case in point – Snowflakes to Butterflies. Many of you have seen my posts “When Snowflakes Melt, You find Butterflies. Corra used her Cube knot version and created a wonderful Snowflake design . I used her knot version and came up with butterflies (shortly after that Corra posted Where there is Butterflies, You Find Flowers). I posted everywhere, what and who had inspired my design. I received tons of positive feedback, So did Corra – we both won! Do you think my Butterflies would have been so well received had I posted it, with no mention of Corra? NO, it wouldn’t have – As a matter of fact, I would have probably gotten negative feedback. I wouldn’t have even had to claim the design as my own, just leaving out what and who inspired me would have made me look like a thief and a copycat. There is nothing whatsoever wrong with admitting where or from who, you found inspiration. I truly don’t understand why people think there is. Oh and don’t think for an instant, that because an artist has been around less time than you, that they somehow deserve less recognition; they don’t. A fellow artist that inspires you, deserves credit whether they’ve been around a few months, few years, or few decades. Both Corra and Perri have new designs (tutorials) out. Corra’s “Friendshipband Bracelet” and Perri’s “Celtic Braid Pendant”, have already given me ideas for some rather spectacular (IMO) designs/variations. What do you want to bet, that when I get my variations done, and give credit where credit’s due, that we don’t all win? Give credit where credit is due! I think – no, I know, you’ll be surprised how much more positively your work is received, and everyone will benefit from sharing.